Veteran jockey Kieren Fallon has been given a surprise call-up to ride Derby second favourite True Story for Godolphin trainer Saeed bin Suroor. Fallon, 49, will replace Silvestre de Sousa in York's Dante Stakes on 15 May. 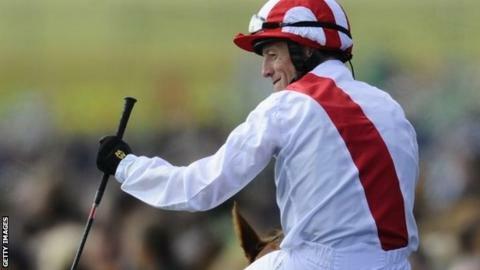 Six-time champion Fallon, who was close to retirement last year, is now effectively joint top stable jockey. "Kieren is one of the best jockeys - he's won every Classic. I'm happy to give him a chance in all the big races," said Bin Suroor. Fallon, who last won the jockeys' title in 2003, is enjoying a renaissance this season and won his first Classic for eight years when triumphing on the Richard Hannon-trained Night Of Thunder in the 2,000 Guineas at Newmarket on Saturday. It is expected he would keep the ride should True Story win the Dante, which is a recognised trial for the Derby at Epsom in June. His mount is currently 8-1 second favourite behind Australia, trained by Aidan O'Brien. The increasingly prominent role for Fallon with the Godolphin team, owned by ruler of Dubai Sheikh Mohammed, is the latest twist in a colourful career. He has won the Derby three times and held top jobs with leading trainers such as the late Sir Henry Cecil, Sir Michael Stoute and O'Brien. The Irishman has also served two drugs bans, admitted an alcohol problem, suffered a severe shoulder injury and been cleared after an Old Bailey race-fixing trial. Most Flat jockeys do not compete at the top level beyond 50, but Fallon impressed Godolphin when he rode for them in Dubai during the winter. "We enjoyed using Kieren Fallon in Dubai earlier this year, both as a jockey and a work rider," said Bin Suroor. De Sousa rode True Story to a seven-length victory in the Feilden Stakes at Newmarket last month, and won the Dubai World Cup for Godolphin on African Story in March. But the Brazilian rider, who joined Godolphin two years ago alongside then stable jockey Frankie Dettori, will now face competition from Fallon for the big rides. "We hope to be well represented at all of the major British meetings this year and Kieren will ride for us along with Silvestre de Sousa," added bin Suroor. "Both jockeys are integral members of our team."